I thought you might like so see some Lace bobbins up close. The first group are called Midland Bobbins (English Midlands) They are use exclusively in English type laces. The bobbins are very light weight so to maintain tension the bobbin was weighted with beads, called spangles. 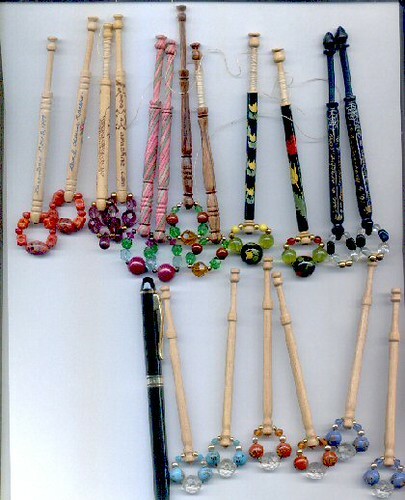 Many antique bobbins have hand made glass beads or buttons in their spangles. I have seen bobbins with uniform buttons from the Napoleonic wars. The bobbins were home made from wood, or bone. The bobbins I have are modern and simple. There are Mother and Babe bobbins. Where the shaft of the bobbin is carved and a miniature bobbin is inside. 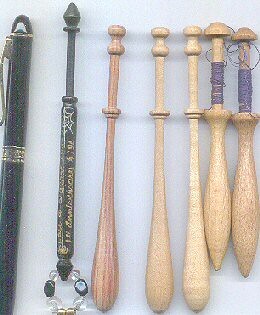 Many old bobbins have messages on them from the person who made them to the lace maker. They were often given to women by their sweethearts. But make no mistake lace making was not a romantic occupation. The lace makers worked for a lace dealer. He supplied the pattern, called a pricking and the linen thread. He would come back and inspect the work. If it was unsatisfactory he took the work and the lace maker was now in debt for the cost of the thread. The linen thread was very very expensive. In some places in England, lace makers worked in groups in a cottage. There was no electricity so water filled glass bowls were place in front of candles. The best lace makers worked closest to the candles. Woman and children worked hunched over their pillows for 12 hour days. Many lost their eyesight. When the Industrial Revolution was in full swing, many mothers saved up to send their daughters to work in the factories rather then see them become lace makers. In some areas men worked on lace during the time when the fields were fallow. But it is doubtful that men ever worked on really fine work, because lace making was a finely honed skill. I added a ball point pen for size reference. These bobbins are called Continental bobbins. They were used all over Europe except for England. They are heaver with the weight at the bottom of the bobbin and did not need spangles. Although a pillow filled with Midlands bobbins looks beautiful, I prefer working with Continental bobbins. The longer bobbins are called Bayeux bobbins and the shorter are Danish bobbins. Their are many different types of Continental bobbins, developed to deal with the different types of lace made in various areas of Europe. There are many many tools used in bobbin lace. Lace pillows can be more expensive then a bathtub full of cashmere yarn. A lot of lace makers make their own pillows. My Mother and I made three of them. I will put up pictures at some future time if anyone is interested. Pins, prickers, pin lifters and pin pushers. The pins have small heads and after awhile you get holes in your fingers from pushing them into the pricking/pillow. Thank you for for interesting post. I had no idea such an art existed and now I want to know more. Please do show us your pillows. Suzann, I knew the lacemakers frequently went blind but I had no idea how bobbin lace was made or the tools used or just how bad things were for the lacemakers. Thanks for posting about this, it is sad and fascinating. I'd love to see your bobbin lace. You amaze me with your lacemaking skills. Thanks for the info on the lace. The pictures of the bobbins are beautiful. I enjoyed your posts about bobbin lace. I took a few lessons 3 years ago and am still learning. You are so right about expensive equipment for bobbin lace. I yearn for the days when I was content with a shuttle and a ball of tatting cotton! You probably need one, don't you? Your lace work is impressive. Thanks for the education.